Once upon a time, “Revolution” was topping the airwaves, Steve McQueen was behind the wheel of his Porsche 917 at Le Mans, and the automatic square blue chronograph on his wrist was toppling the supremacy of the small round white timepiece. 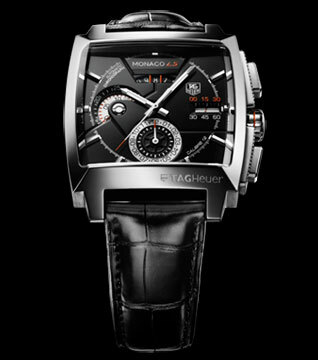 The MONACO by TAG Heuer would forever change the way the world looked at watches. Today, TAG Heuer is celebrating the 40th Anniversary of the MONACO with a new high value product, the MONACO Linear System (LS). The Men’s MONACO LS Chronograph Calibre 12 does justice to its sire: this generation’s anthem comes to us as if in a dream, in an otherworldly, high- tech voice. A Dubois Depraz calibre allows the seconds, shown in a linear date opening, to be read linearly from the tip of a double red rhodium hand. Taking its inspiration from the MONACO 360 Concept Chronograph, this dial is black as space with fine brush bridges while the faceted, polished and fine-brushed minute and hour hands glow with unearthly luminescence. Chronograph dials and an angled date window at 12 o’clock put one in mind of a cockpit of race car or single manned space vehicle. The 40.5 mm case is ready for any heights (or depths being waterproof down to 100 m) the wearer may seek. True to the tradition of the first MONACO’s first wearer, the black alligator leather band celebrates the rebel in every man. A steel bracelet offers an option for those with a more futuristic bent. Not content to stop at making the virtuoso watch of the future, TAG Heuer, through the magic of movie making has brought together two virtuosos of the racing circuit: Steve McQueen and Lewis Hamilton, the 2008 Formula 1 World Champion. As they bandy words and cross swords on film, their point and counterpoint is accentuated by the difference on their wrists: on the actor’s, the original MONACO, on the champion’s, the MONACO LS.